Yet even at the time Amos was writing, there were already scriptures in existence. My Bible history is a bit hazy, so I don’t know exactly what writings were available at the time (the study Bible says this came 40 years after the prophecies by Elisha in 2 Kings 13, with the implication that the Jews would have been familiar with these prophecies, so it sounds as though there was a lot on record already), but at the very least they had the law of Moses and other early writings. 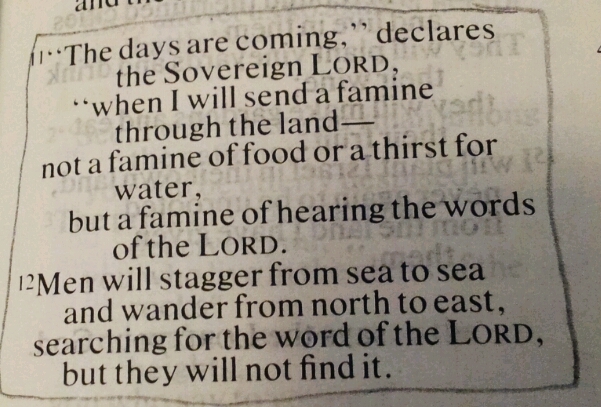 Those would not disappear, so what is this famine? At least, that’s how I understand it: God may go quiet, and we may find it hard to hear from him afresh, but we’ve got his Word and there’s everything in there that we need to know.